To be eligible for the MBA program, applicants must hold a four-year degree in any field from an accredited college or university. Students are evaluated via an admissions formula, which calculates a student's GPA and GMAT scores to determine their eligibility for admission. Therefore, you can balance out a lower GPA with strong performance on the ...To be eligible for the MBA program, applicants must hold a four-year degree in any field from an accredited college or university. Students are evaluated via an admissions formula, which calculates a student's GPA and GMAT scores to determine their eligibility for admission. Therefore, you can balance out a lower GPA with strong performance on the GMAT, or vice versa. No matter what your GPA, a minimum GMAT score of 400 is necessary for unconditional admission to the program. Around 40 percent of incoming students do not have undergraduate degrees in business. “There is an incredible sense of student spirit and pride” on the Pitt State campus, and a “strong diversity of cultures” within the business school. In addition to attracting a fair­ly large international population, the School’s “proximity to the borders of Missouri and Oklahoma makes it a viable and excellent choice for students in these neighboring states.” Together, students get a nice mix of regional culture and international perspec­tives. “Teamwork and presentation skills” are stressed throughout the curriculum, so students have many opportunities to work together during the program. While the atmosphere is comfortable and collegial, the physical environment is less appealing. Pitt students admit, “the business school could use newer facilities.” Beyond coursework, “it is very easy to get involved and meet other students” in the MBA program. In the evenings, “there are always social events on campus with a vari­ety of clubs and organizations.” Student clubs provide “great networking opportunities, as well as opportunities for teamwork and leadership” outside the classroom. To compli­ment the academic programs, “Every week, there is some sort of guest speaker” on cam­pus, and the administration organizes “special seminars and other events every Friday.” From Big Brothers/Big Sisters to political groups, “there are a lot of school-run clubs and student organizations” on the larger Pitt State campus, and many of the younger stu­dents get involved with collegiate activities.” The surrounding community of Pittsburg, Kansas is “somewhat small, isolated, and conservative,” but the atmosphere is “very friendly” and highly supportive of the University and its students. Pitt State students can get professional development assistance at the University’s Office of Career Services. The office provides reference materials, career counseling, and resume preparation services, while also coordinating on-campus interviews and recruit­ing events. They host several large career expos annually, as well as smaller events, like workshops and speakers. While these career events are aimed at the entire Pitt State pop­ulation, “there are diverse companies at the career fairs,” many of which are interested in business students. A recent career fair included representatives from Cessna, Verizon, Farmers Insurance Group, General Electric, Northwestern Mutual, Sherwin-Williams, Toyota Financial Services, Walmart, and more. Despite the line-up, business students would like to see a few more big names on the roster. About half of Pitt State’s MBA graduates take jobs in general management, with anoth¬er quarter heading to marketing or sales positions. The average base salary for MBA graduates is $46,000 annually. The school’s biggest employers include Deloitte, Sprint, Walmart, and Allstate. In recent years, anywhere between 75 and 95 percent of students were employed by graduation. Pittsburg State University, located in Pittsburg, Kansas, is a comprehensive public university established in 1903. The Graduate School was established in 1929, and has grown to include more than 50 programs in 30 majors within four colleges. The Graduate School grants degrees on two levels: the master's degree and the Specialist in Education. 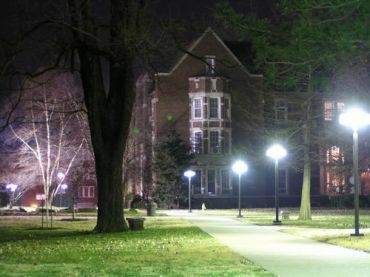 Evening courses, off-campus locations for many programs, and a variety of online courses are offered.The Kelce College of Business, accredited by the AACSB-International Association for Management Education, recognizes the importance of preparing students to meet the challenges of the global workplace. The Master of Business Administration degree (MBA) is a professional program designed to prepare future business executives to join the corporate ranks or start their own business. Pittsburg State University offers an MBA degree with concentrations in accounting, general administration, or international business. The MBA is designed to accommodate students from diverse educational backgrounds and interests. Approximately 40% of the students admitted to the MBA program do not have undergraduate degrees in business administration. Axe Library; total holdings of 350,000 volumes, 624,000 microforms, 1,600 current periodical subscriptions. CD player(s) available. Want more info about Pittsburg State University Gladys A. Kelce School of Business Part Time MBA? Get free advice from education experts and Noodle community members.